We rarely take taxis when we travel. We prefer to take the subways or buses, depending on the Cities. Mexico City was no different. Our hotel wasn’t all that close to a Metro Station but that didn’t stop us from using the train every day of our visit. All else being equal, if given the choice between taking the City bus or the subway, I’ll always choose the subway. You know where the subway is going to go – and while they can alter the stops (skipping one or more), the train never goes on detour and takes a different road and drops you off god knows where. 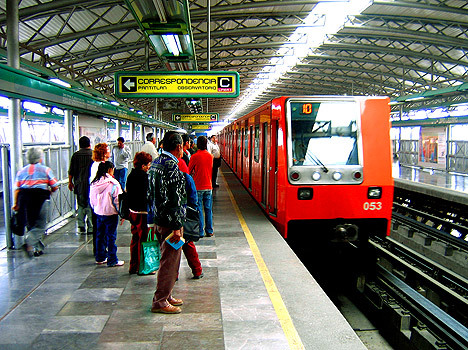 The Mexico City Metro is very large, with 12 Lines, and 195 Stations. It is the 11th largest (based on length) in the world with 1.6 billion (yes, with a ‘B’) rides annually. The frequency was absolutely amazing too – we never had to wait more than 3 minutes for a train any time we wanted to ride. That aspect reminded me so much of Paris. What didn’t remind me of Paris was how crowded the cars got, especially on the weekends. We actually had to wait for the next train a couple times on Saturday since the car was absolutely packed. Despite the cars operating at more than full capacity, there was still plenty of room for men with huge speakers strapped to their back playing their (or their family members) new music from their mariachi band (mostly – although some people were selling their own rap albums). Honestly, some of the bands/artists were quite good. People were also selling all sorts of small crap – which I assumed they just stole from a store and are now marking a profit off of it. On the train we could buy batteries, gum, candies, postcards and one lady was even selling small bottles of cleaning supplies and toothpaste. What was more surprising is that people were actively buying this crap. One lady we watched on the train bought something from every single vendor that passed. She looked like she was doing her Saturday shopping without ever leaving her train seat. We did not buy anything on the train – my biggest concern was that (even if we wanted something) when we were purchasing it, the vendor’s cohort would then be picking our pockets, etc. This sales practice seems all the norm in Mexico City – no one batting an eyelash (except when the music was so loud and jarring you couldn’t help but close your eyes, so they wouldn’t burst out of your head. All in all, I would highly recommend using the Mexico City Metro to get around the City. Just like subways in other Cities (or any place with a large number of people in a small/confined area), be aware of your surroundings, keep your valuables secured (in zipped pockets or better yet, locked up in your hotel room or back at home). Don’t flash any sums of money on the train either. There is no reason to have your wallet out on the subway. There are various subway apps to download, so you’ll always know where your closet station is. Head over to the official Mexico City Metro website to review the maps now. Live like the locals. Take the subway. What is your favorite mode of transportation while traveling? Do subways frighten you? We love to take bike tours when we travel. We’ve seen Stellenbosch, South Africa, Paris, Barcelona, Dublin, Shanghai, Vietnam and London by bike. Mexico City easily made the list of Cities we wanted to explore by bike as well. As in the past I turned to TripAdvisor but this time, I found a single bike tour offering – luckily it looked interesting. I shot an email to Mexico City Bike Tour, explaining to them what we wanted to see and how much time we wanted to spend. They responded within a couple hours letting me know that their standard Chapultepec-Reforma-Roma-Condesa tour would fit our needs. Book it! We met our guide at their “office”, which is really just a shed where they store their bikes. Two other travelers joined us on this tour – both singles – one man from Boston and a young female chef from China, who lives and works in Orlando. After brief introductions, we were given helmets, retro-reflective vests and a bike. The bikes were a little run down – by far the worst condition of any bike tour company I’ve used in the past. The breaks were a little shoddy and my seat wouldn’t stay at the proper elevation — several times I felt like I was riding the bicycle equivalent of a low-rider. I was concerned about my personal safety from time to time while on the ride, that’s for sure. The tour was lead by a great guide who is a trained urban planner, with a passion for the environment and a mission to change the way we all think and live in modern Cities. Mexico City has an amazing traffic problem – but surprisingly (at least to me) a popular bike share program that’s been around since February 2010 and currently has more tan 4,000 bikes and 276 stations. We made dozens of stops throughout our 4 hours bike ride. Our first stop was about 5 minutes from our meeting point. This first quick stop was to confirm that our bikes were all in working order (and mine was at this point), to learn a bit more about our guide and go over the basics of the program. Antonio asked each of us what we were passionate about – what we wanted to learn while on the trip: History? Architecture? Food? Politics? Colonialism? Future of Mexico? Our group of four were really focused on History and Architecture – thank god we didn’t have a group of anti-intellectuals who just wanted to ride from bar to bar (not that there’s anything inherently wrong with that — just not something I was keen on for this ride). First stop – showing off the poinsettias. The City was really prepping for Christmas and these beautiful flowers were being planted far and wide. On our trip we learned about the Spanish invasion (my words, not Antonio’s) of the Aztec empire and the subsequent draining of the lakes around current day Mexico City. We also learned about the impact this had on the land and how the area around Mexico City is still settling and you can easily see the impacts of this settling. We came across an Obelisk that was constructed in the early 20th Century and over the past 100 years has sunk quite a bit – requiring additional stairs to be constructed (you can see the different colored stairs – this is how much the surrounding area has sunk). We toured Chapultepec Park and learned about various native plants and saw exhibits that showed how the area that is now Mexico City looked around the time of the Spanish invasion. We continued down the Reforma (where our hotel was located), which is a street full of tourist attractions (shops and hotels) and is a major street where the residents of Mexico City celebrate and protest (which, you’ve read about here). Our guide passionately educating us about Mexico City and her History and Architecture. Our guide found a great little place for lunch – a place he had never been before, but his colleagues had recommended. We ordered several appetizers and entrees all to split. The chiles rellenos were by far my favorite. Although the place we stopped didn’t have a visible sign and our guide who knew the exact intersection had a hell of a time finding it – sorry guys. We began winding our way back through the park stopping to take pictures and to allow one of the slower members of our group to catch up – this last portion had more elevation to climb (some hills and some man made elevation like overpasses, etc) than anywhere else on the tour. The slowpoke in our group also wasn’t an avid bicycles, so often she’d swerve unexpectedly and run into other members of the tour. She was a bit rogue – I had to stay away from her while riding. We managed to make our way through the winding streets back to the little shed where the bikes are stored. I enjoyed our bike ride through Mexico City. I still feel this is the best way to experience any City. 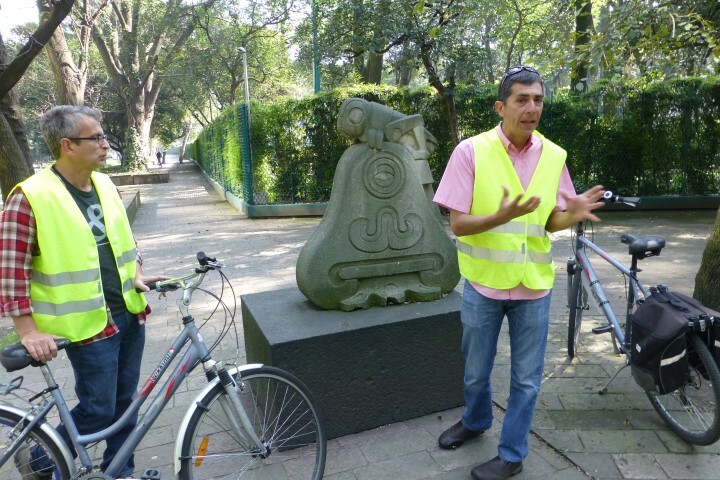 Unlike other tours, our guide had an interesting professional background – instead of being a student who had studied a script, this guide was a trained urban planner with a vision for the future of Mexico City and all modern Cities. A vision where cars aren’t the required mode of transport and the pollution they spew aren’t choking all life in the area. As noted above, my biggest concern was the operational safety of the bikes themselves. I thought the guide was very knowledgeable and passionate about cycling and the evolving City. 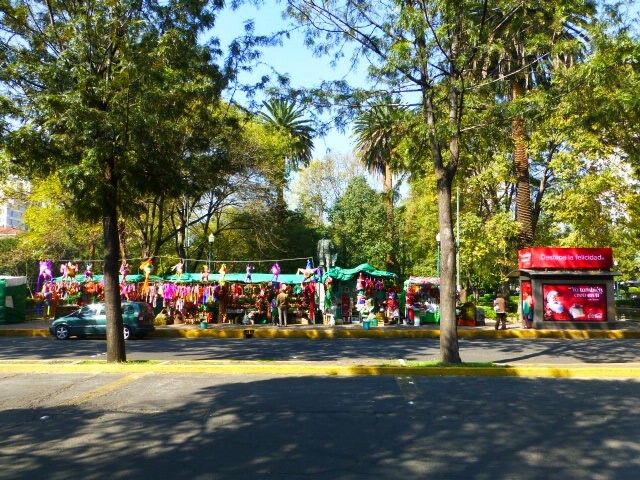 Have you biked in Mexico City? Do you prefer to have a trained professional (architect, urban planner, historian, etc) or just a normal person whose been trained as a guide? 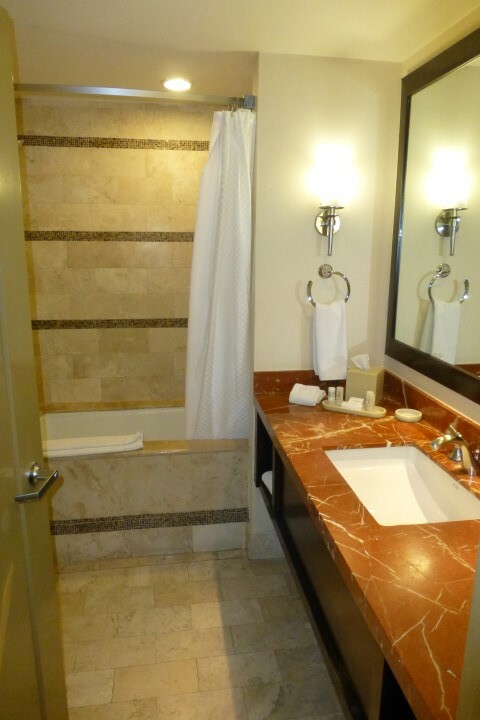 We decided that the Le Meridien Mexico City would be our home during our quick stay in the City. I was pushing for a Starwood Property so I could be guaranteed Platinum Status for 2014 – the next issue was which Starwood Property. MS had stayed at the W previously and he described the area as a bit like the Viagra Triangle (an area in Chicago with touristy mediocre restaurants that are frequented by douchy patrons — you get the idea, every City has one of these areas). That being said, we decided to give the Le Meridien a try – away from Douch-town. 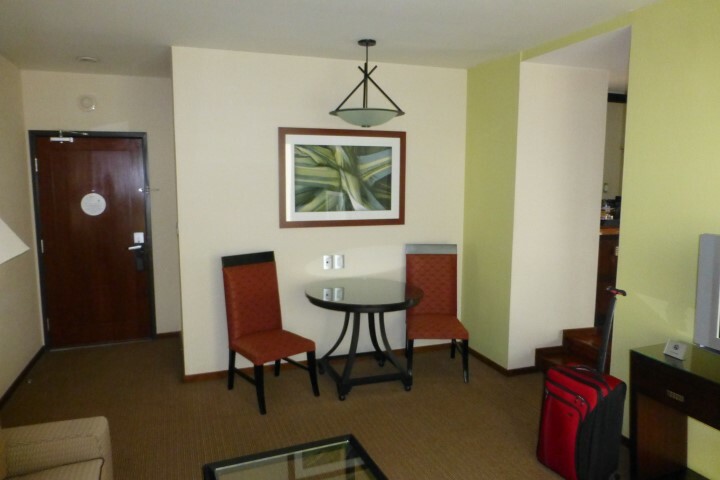 The rate we got, I thought, was pretty reasonable – with all the taxes and other fees associated with hotel bookings, our nightly rate was $146. 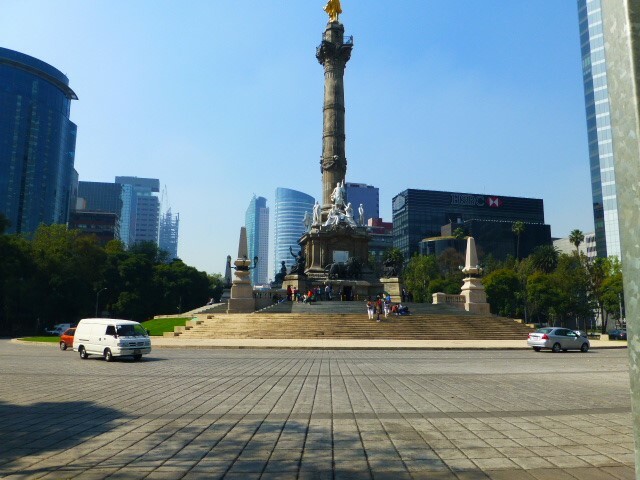 The hotel is located on the Paseo de la Reforma, which is a major boulevard that cuts diagonally across Mexico City. The building itself looks very modern and sleek from the outside. The cab driver wasn’t really sure where the hotel was – we gave him the actual address as well as the major cross street, but he was still a little confused. It took us about 25 minutes to get to the hotel from the airport. Once we pulled into the porte-cochere two bellmen leapt to help us with out bags. The lobby is located on the second floor of the hotel while the first floor has a Starbucks and the hotel’s restaurant – C’est La Vie. As a side note, we only ate at the restaurant once, for breakfast after our first night. The buffet was slightly better than I was expecting, but I also have horribly low expectations when it comes to hotel breakfast buffets – especially outside of Asia. The $30 price tag was a bit much for this buffet – that’s or sure. We were welcomed at the check-in desk with a hearty “Bonjour…buenos dias”. I introduced myself in French and was met with a blank stare – so I switched to Spanish which was slightly more recognized. The young woman working reception jumped into English, which served us all well. She then explained the hotel amenities to us, including the restaurant, the business center, the fitness center and she made a special point to talk about the ice machines – an odd thing to focus on. We were then given keys to our room on the 12th Floor and told that our luggage would join us shortly. 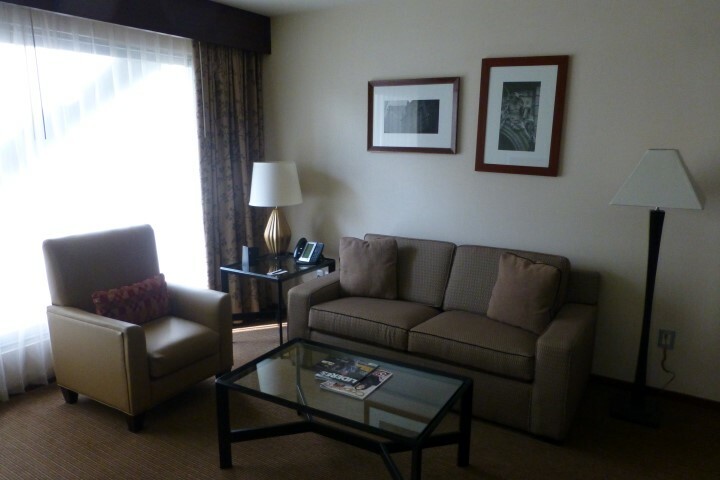 The room was quite spacious – much more so than I was expecting. We entered into the living area which had a couch and a chair in complimentary colors/style facing the TV and two pseudo dining chairs flanking a cocktail table opposite. Heading up a couple stairs the bathroom was to the right and the mini bar to the left. 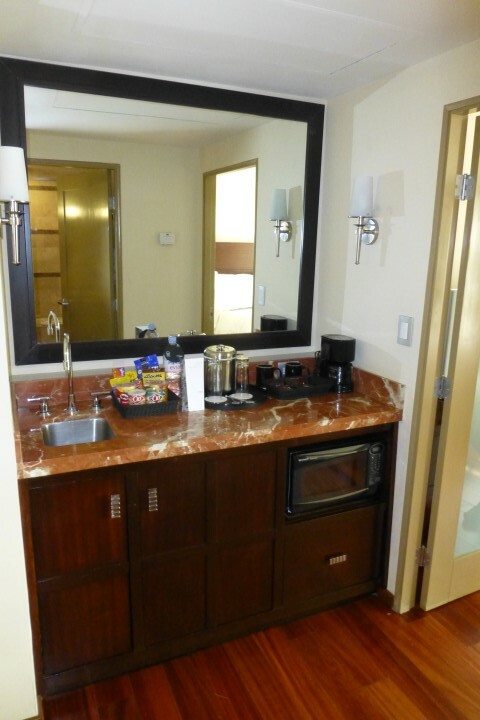 While I never really use the mini bar, this one was nice, as we could use the sink to brush our teeth while one of us was in the bathroom. Speaking of the bathroom it was in good shape – clean, good water pressure and good temperature control (no surprise freezes or scaldings). It was a bit tricky getting in or out of the shower — the ledge was quite high, which was more problematic when exiting the shower as the step down was quite steep. This was exacerbated by the fact that the shower curtain didn’t really keep the water from running all over the tile floor. We both nearly broke our necks the first morning. We figured out the idiosyncrasies pretty quickly though (Darwinism at its finest). The previously mentioned mini bar area had a handful of snacks and a fridge partially full of both alcoholic and non-alcoholic beverages. We did not partake – mostly because we are cheap – the idea of a $7 Kitkat Bar is really too much for me. The bedroom was quite comfortable as well. 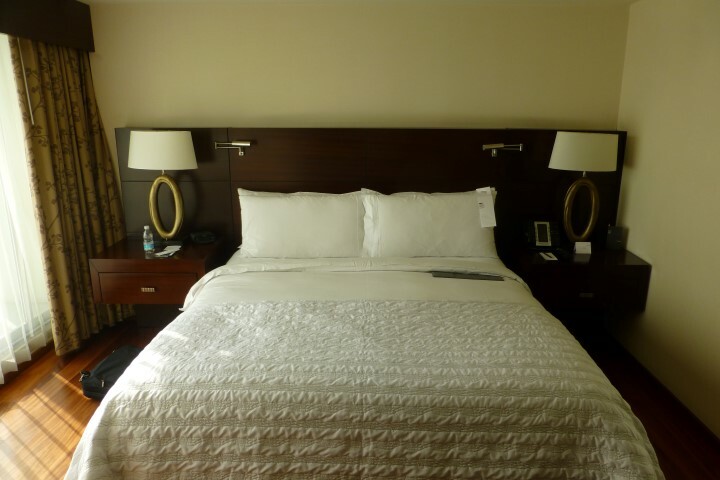 We had a nice king sized bed that was not nearly as comfortable as our Heavenly bed at home, but I (who am a pretty light sleeper) got use to the lumps of this mattress pretty quickly and quite honestly, slept very well after the first couple hours on night one. 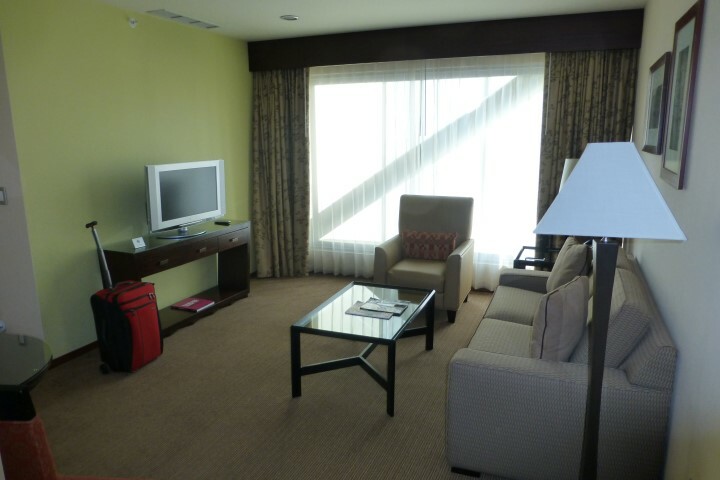 The bedroom area also had a TV, which we only turned on when we were getting ready in the morning – and I watched TV5. My biggest issue, as is my normal complaint, there were no accessible plugs next to the bed. I had to plug my phone and tablet in across the room. I like to keep my phone close to me at all times. 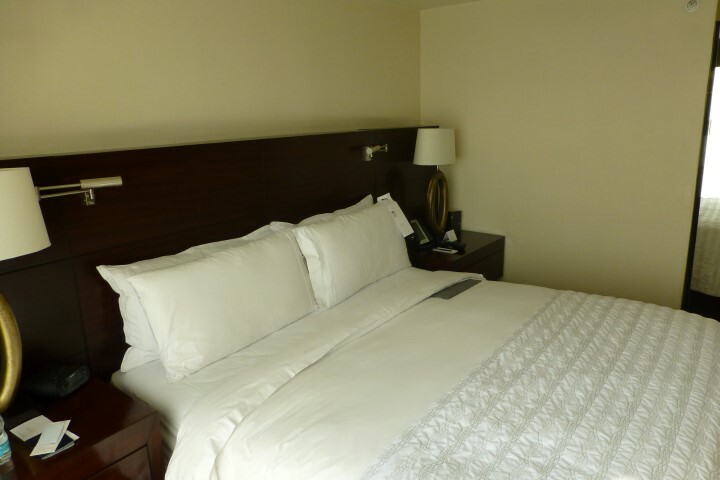 Often when I travel, I will use a white noise app, mostly because of a snoring travel companion, but depending on the City and the hotel room itself, I do find it comes in quite handy. 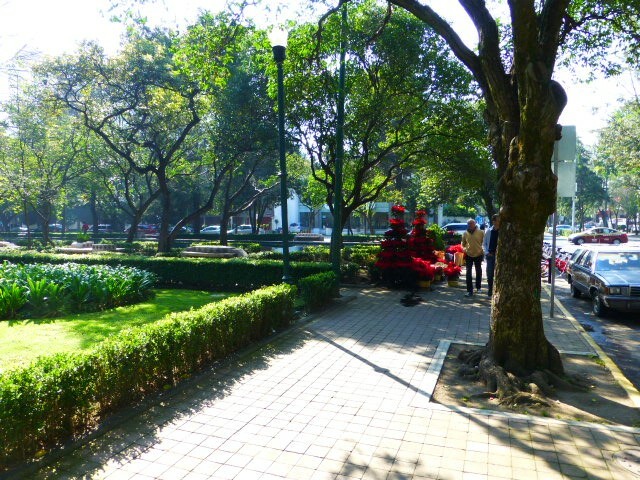 Speaking of noise – our room faced out on to the Paseo de la Reforma but we heard no street noise whatsoever. Each night when we returned from our daily adventures, we found that our room at been cleaned and then (assuming later in the day) turn down service had been completed. We were left with sweets on the pillow each night — and boy were they gross. Basically we were left with the sugar/jellied candies that tasted like something your great aunt would serve when the kids came over. I appreciate the touch and I’m sure many people like this type of treat, but it really was outside of my wheel house. I have two problems with this hotel. The first relates to our departure. Our last night in Mexico City, we returned to the hotel around 22h30 and asked the front desk what time we should get up so we could make our early morning (~07h00) flight home. They suggested having a cab pick us up at 05h15 – fine. At 05h15 we are waiting for the taxi, which the hotel had pre-arranged for us — which coincidentally never showed up. We were put into a separate cab just in the nick of time. The Paseo de la Reforma was being shut down for a massive protest. Thousands of people were being bussed in from all over the region to protest governmental action or inaction (it wasn’t clear). The bellman told us that if we hadn’t gotten out when we did, we’d have to walk more than a mile to get around the blockades and find a taxi. This really frustrated me because this was the first and only time we were told there may be traffic issues (especially at 05h30 on a Sunday morning). I think what also makes me frustrated was that the hotel had been very good about communicating other irregularities — for example, C’est La Vie (the hotel restaurant) was closed for a private event — we were informed by the bellmen when we walked in and we had a written note from the management team the day before the closure. I was impressed. That all went away the day we left. They delivered more than I expected in some instances but didn’t in others. The other problem with this hotel really is the location. Yes, it’s on a major thoroughfare and relatively close to public transit, but there isn’t a whole hell of a lot going on in this area. I hate to say it, but next time I think I’ll stay over near the W — despite the douchebags and tourists — at least there are bars within walking distance of the hotel. This was my third Le Meridien stay ever — all in 2013, come to think of it. In March we stayed at the Le Meridien Angkor and then in June we stayed at Le Parker Meridien. All in all, I like this Starwood brand. Each hotel is completely different – different style, different vibe. Unlike the W, where no matter what City you’re in, you know you’re in a W.
Have you stayed at the Le Meridien Mexico City before? Did you like the property and the neighborhood? 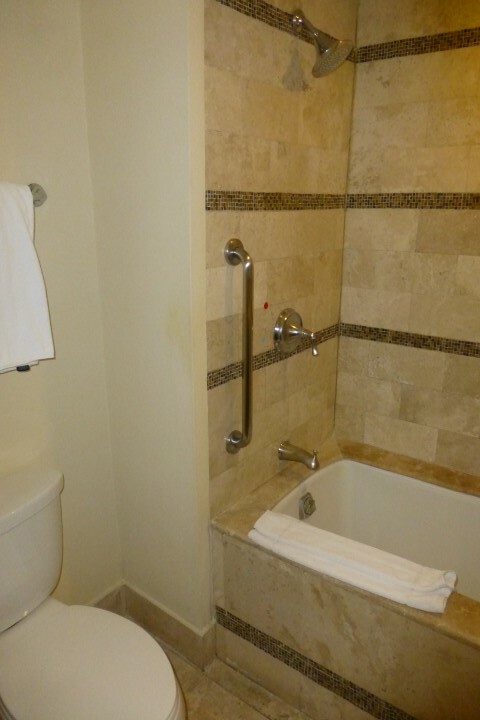 Next time you are in Mexico City where would you stay? Our trip to Mexico City for the weekend started with pretty short lines at ORD, which allowed us quick access to the United Club. I usually only visit the United Club near B17 at ORD (it’s newer and I can almost always get a nice seat in the back area, near the bar). 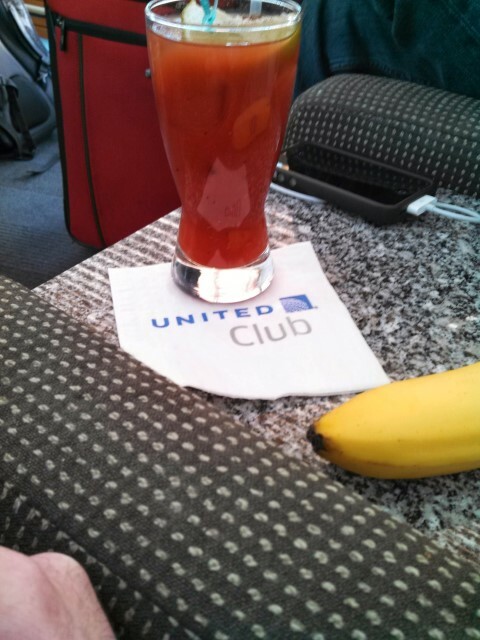 We were heading off on vacation and I decided to kick off my vacation with a little United Club Bloody Mary. Shortly after we arrived at the Club, my phone buzzed – our flight was now 45 minutes delayed. I had a second Bloody and after 30 minutes decided to head off to the gate. As we arrive, we found the gate area was completely empty. Boarding had began on schedule and United failed to update the big boards. Pre-Vacation United Club Bloody Mary and Banana. Breakfast of champions. We got on board and were met with one of the rudest flight attendants around. She was quite frustrated that we weren’t already seated. She was also quite upset that we were attempting to put our bags in the overhead bin. She, very curtly, told us to go take our seats and when I told her we were her last two passengers up front, she got even more frustrated. I stowed my bag in the only open bin I could find – above row 20 – the first class stew wouldn’t allow me to stow my bag in the closet up front either. It was clear, I had made this woman’s day utterly miserable – and she did not hide it. The door closes, we pull back from the gate and immediately go to the penalty box and sit for another 30 minutes. Once we were airborne the stew was still crabby, but she did make a screwdriver for me. I’m not a breakfast person in general and airline breakfasts are pretty mediocre – so when it came time for me to order breakfast I just ordered one of the buy on board options from Economy. She told me that I wasn’t allowed to order from a different cabin (that’s the first time I’ve come across that before). She finally agreed to allow me to have a sandwich when I told her I’d pay for it. The gentlemen from coach who delivered the sandwich was floored that she was going to make me pay for this meal and he gave her quite the glare as he pushed my credit card away and walked back to coach. Other than the rough Stew up front and the pre-departure time in the penalty box, the flight was pretty smooth.We even arrived prior to our scheduled time despite leaving nearly an hour late. We touched down and headed through customs / immigration and were in a taxi heading to the Le Meridien within 20 minutes (we even stopped at the ATM for cash). 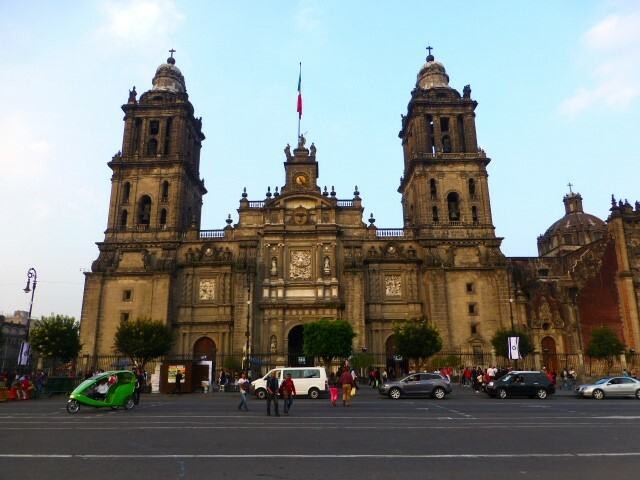 This was my first time to Mexico City. My first impression of the airport was that it stunk like no other – actually, it smelled a lot like the Frankfurt Airport – smelling of cigarettes and feces. Lovely. Have you ever been put into the penalty box when you departing? How do you handle super cranky stews? Following our great trip to Ireland in 2012 for Thanksgiving, we decided to visit someplace a little closer to home and a little warmer. We decided that Mexico City would be fit the bill. I had never been and MS had only been there for work with limited time to explore the City. My main reason for choosing Mexico City was for the food – I love Mexican food. I also wanted to visit the City before the next earthquake, which undoubtedly will destroy many of the historic buildings. Our trip was only five days from departure until return. Over the next few weeks, I’ll be telling you about the following aspects of this trip. What did you do for Thanksgiving? Did you spend time with family/extended family or did you jump ship and head off with friends to explore on your own?